Purchasing a certified pre-owned vehicle is often a great way to save some money over buying new. CPO cars are supposed to go through a rigorous process to acquire that certification, making it a bit better than just a "used car." Honda and GM are cracking down on dealers who cut corners on the certification process. Brian Butts, manager of auto remarketing at American Honda, and Larry Pryg, national manager of GM Certified used operations, they told Automotive News in order to maintain the integrity of their respective brands' certification programs they have suspended some dealerships from selling CPO vehicles. 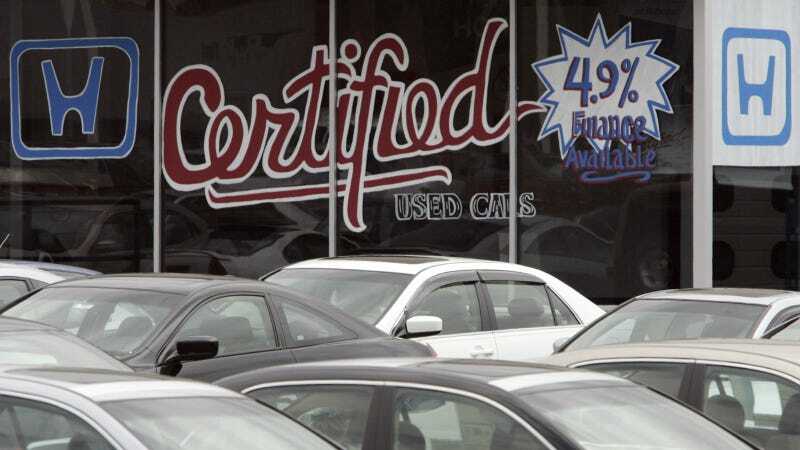 Neither representative would disclose exactly how many dealers were suspended, but they did say that most of their dealerships adhere to the proper certification process. Honda and Acura are re-examining their CPO programs to ensure a quality vehicle is being sold on the pre-owned market. Within the restructuring effort the automaker is altering the way it oversees dealer compliance. If the automaker determines a dealer is out of compliance that store loses their ability to sell Honda/Acura certified vehicles for 90 days. They must then submit a corrective action plan to re-qualify for CPO sales. While industrywide CPO sales were up 9% this year. Honda's certified vehicle sales are down 7%. The dealer suspensions contributed to this decline, but the Japanese tsunami in 2011 limited production volume. So there are less cars coming off lease for to be re-sold as CPO cars. For several years, GM has a program that sends representatives to dealerships several times a year to make sure the dealers are certifying the proper vehicles. However, in the past 18 months GM has begun to monitor the process more closely and issue suspensions to dealers who are not maintaining the process. Both brands are attempting to increase the consumer confidence with their pre-owned vehicles. The interesting thing is Honda has a reputation among the average car-buyer for quality and reliability, so they want to maintain status-quo. While GM in the wake of massive recalls is looking to re-build that consumer trust. Does the increased scrutiny from these brands on their dealerships make you more or less likely to purchase a CPO car from them?